A blog documenting my intellectual love affair with our many-armed friends. 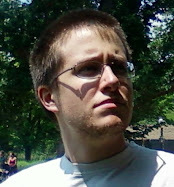 This week, I was graciously invited to join the Southern Fried Science blog network. I accepted, and so will be relocating to www.cephalove.southernfriedscience.com . All of the old posts have been copied to that site, and no new posts will show up here. I'm sorry if this is a hassle for all of you generous souls who link to me, but please continue to link to me at my new and improved location! Thanks so much to all of my readers, and those of you who put up with my rambling comments on your own blogs. If there is one reason I have enjoyed blogging, it's your feedback and encouragement. 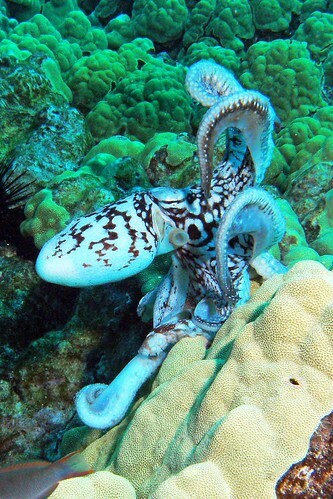 The vertical lobe is one of many lobes in the cephalopod brain. It sits above the oesophagus, and receives input from the sensory systems of the arms and visual information from the optic lobes. It is classically associated with learning, so that removal of the vertical lobe results rather reliably in deficits in the learning of a discrimination task. When asking questions about the presence of short and long term memory processes, one has to differentiate between the two. Thus, Fiorito and Chichery test their animals at two time points, 1.5 hours after training and 24 hours after training. It's important to note that this 24 hours would not nearly qualify as long-term in human memory, where memories can be stored for many years. 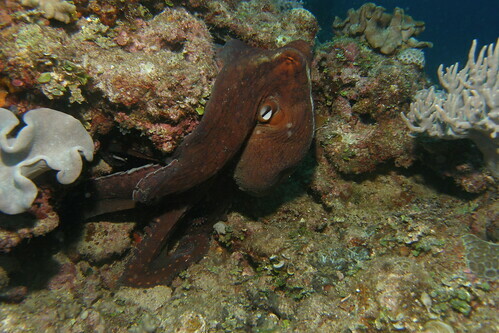 In the octopus, tactile memories have only been shown to be retained for up to 50 days, although interestingly enough, the removal of the vertical lobe after a task has been learned appears to improve memory retention (Sanders, 1970.) I'll get back to this. This is a bit of an odd way of showing the data (I would have done a line graph, myself.) First of all, the bars in each graph show how many of the tested octopuses chose which ball, the red (R) or the white (W). NA is used for trials in which the octopuses did not make a valid response (ie. did not attack either ball.) The white ball can be thought of as the "correct" choice. The top row of graphs shows animals with the vertical lobe removed, and the bottom row shows animals who received a sham surgery. The first column of graphs shows the 1.5 hour test, and the second column shows the 24 hour test. The sham-operated group looks much as one might expect them to - they learn, and they retain the learning. The lesioned group is strikingly impaired. At 1.5 hours, it's clear that the removal of the vertical lobe has hurt performance, as these animals are performing at chance levels. By 24 hours, however, they seem to have improved! This is odd. If we explain this by analogy to human learning processes, we would have to say that these octopuses formed a long-term memory of the task without forming a short-term memory of it first. This indicates that "short-term" and "long-term" memory like what we talk about in mammals is not readily applicable to the description of learning in cephalopods. Consider for a moment the results of Sanders (1970), who found that octopuses who learned a task and had their vertical lobes removed (unfortunately, I cannot find the full text of the paper at the moment and so I don't know the exact procedure) retained it better than those who had intact vertical lobes - that is, they retained it for a longer period of time. If Fiorito and Chichery had tested their octopuses at longer intervals, we might expect that they would find the same results, with vertical lobe remove leading to a greatly delayed acquisition of the memory as well as a slower decay of the memory. This strikes me as odd, as I do not believe that this can be shown to be the case with people. In general, if people cannot remember something for a short time, they cannot thereafter remember it better after a long interval - it is simply gone from the system. I may be wrong about this point (and please point out any counter-examples you know), but it seems to me that the memory of cephalopods doesn't correspond very cleanly to the "working memory-consolidation-long term memory" model that is used to describe human memory. And why should it? Cephalopods may not have memory that looks like ours, but they have highly developed memory systems that serve them well enough. If anything, we should be excited that our theories of human memory cannot explain cephalopod memory very well; the more varieties of memory systems we have to study, the more we can learn about learning, period. This paper is a big deal (theoretically speaking) for a reason besides its illustration of the role of the vertical lobe in the time course of memory. Did you catch it? The authors used an observational learning task. That is, the octopuses being tested did not receive fish for the correct answer and shocks for the incorrect answer in the task. They did the task (correctly, at that) without ever being rewarded or punished for it; instead, they learned how to do the task by watching another animal perform it. When Fiorito and Scotto published a paper on observational learning in the octopus in 1992, people had a hard time swallowing it. It simply did not make sense, critics contended, that octopuses, being such loners, would have the capacity for observational learning. Why would they have evolved the capacity to be cooperatively social? The fact that they can learn by observation is one of the arguments that proponents of cephalopod consciousness (that is, the idea that cephalopods have some form of conscious awareness) often cite this as evidence of their general powers of cognitive representation. The octopuses are not being social, they're just being smart. At some level, they appear to have a representation of themselves and other beings, enough that they can learn a simple task by observing another octopus do it. In any case, replicating this finding adds some weight to Fiorito and Scotto's argument that octopuses can learn by observation. At National Geographic, you can check out some footage and a story about the successful attachment of a critter cam to a Humboldt squid. I'll have to get ahold of their television show somehow, seeing as I don't have TV, and it was last Friday, anyways. Although it's an old piece, I want to point out this article on the expansion of the Humboldt squid's range. It's a very interesting topic, and one that is still (as far as I know) ripe for investigation and theorizing. PZ Meyers points out a video claiming (among other things fallacies) that the fossil record of coleoid cephalopod ancestors provides evidence against "macroevolution". Of course, the alternative, and so presumably correct, theory is "Intelligent Design". Wow. Folks in Delaware can head down to the Delaware Seashore State Park and dissect a squid for $8, among other great activities. Now that's good use of public facilities! Please, stop me the next time I start throwing around "incendiary rhetoric"on Cephalove. Check out this cool video of giant octopus kites. And then this one of S. latimanus in an agonistic encounter, complete with some great changes in coloration. Circus of the Spineless #53, that virtual periodical on all things invertebrate, is up at The Birder's Lounge. Make sure to check it out for an interesting assortment of writing on all sorts of spineless wonders. I'll be back later in the week with some more cephalopod photographers, and a few science-y posts. I'm thinking about tackling the "cephalopod consciousness" issue, although it will take a bit of work to get ahold of the literature, read it, and then work out where I stand. Nonetheless, I'll see what I can get up here. 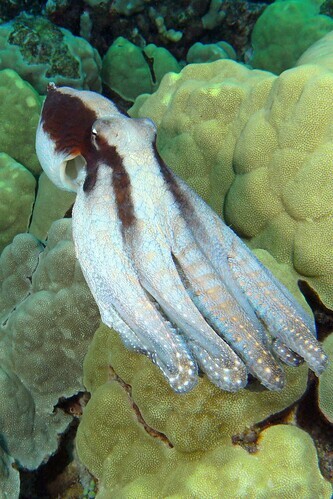 Today's cephalopod photographer of note is Barry Fackler, a physical therapist originally from Pennsylvania who lives and dives in Hawai'i. All of the photos in this post are his, and they're all click-through-able, so check out the larger sizes. 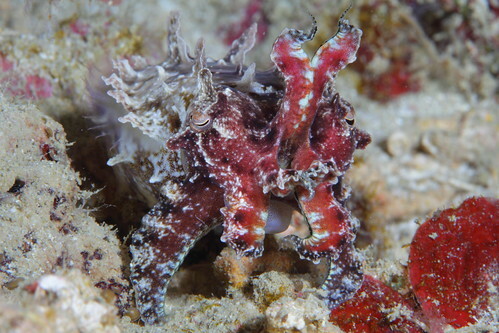 It turns out that octopods (mostly O. cyanea) are the only cephalopods in his Flickr portfolio, so I'm sorry to disappoint the squid and cuttlefish lovers out there. I promise they are all wonderful photos, though! Here is an O. cyanea showing a mostly white color pattern while jetting, a behavior often associated with defensive flight. I always love to see octopuses express dramatic papillae. In this next shot, we see an octopus who is apparently trying to look like just another chunk of coral, even if he's not doing a terribly good job. 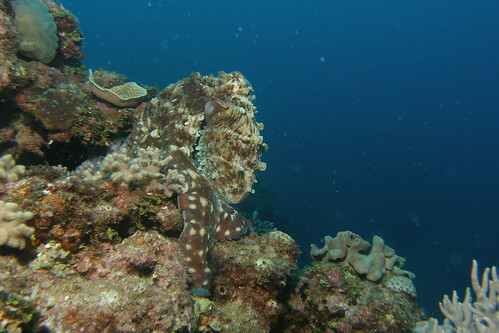 This next one shows an octopus (O. cyanea again) in a defensive posture. Notice the high contrast color pattern, the curled arms, and the spread interbrachial web. The point of this behavior is to look big enough to make a potential predator think twice before he eats you - it's a common strategy among prey species. According to Barry, the animal adopted this pose when approached by some fish. I like this next shot simply because you can see right into the octopus's mantle. It's somehow fascinating to me to see the inside and outside of an animal at the same time like this. These next two photos show some behavior that I had never heard of before reading the photographer's description. 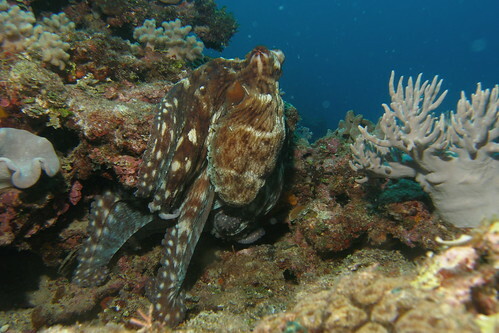 Apparently, the fish (a peacock grouper) was following this octopus around to feed on small prey that the octopus stirred up as it foraged over the reef. 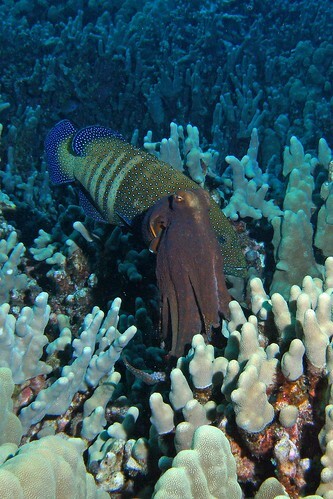 According to Barry, they usually follow eels, but he found this one hanging around a hunting O. cyanea. I'd argue that it is probably not cooperative hunting per se, as it's unclear how the octopus would benefit from it, but it's fascinating behavior nonetheless. 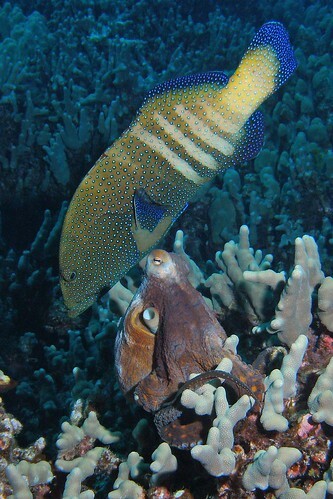 I'll finish up with two gorgeous portraits of O. cyanea just sitting on the reef. I love the colors of these octopuses. Thanks for reading! 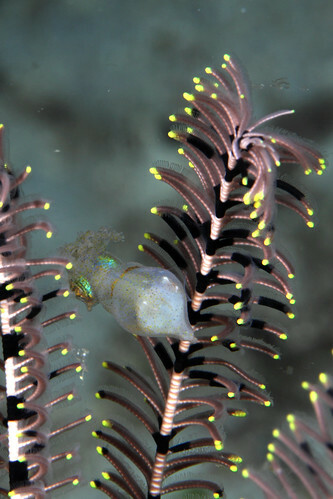 Make sure to click on over to Barry's photostream and check out his other underwater photos. Basically, LTP (long-term potentiation) is one of the mechanisms by which neurons are thought to adjust how they connect to each other during the process of learning - specifically, they become stronger (or potentiated,) meaning that signals are carried across the synapse more effectively. The authors of this paper use a technique by which they induce LTP in synapses in the octopus vertical lobe (a structure thought to be involved in learning and memory) and study the effects of serotonin (also called 5-HT, which is short for 5-hydroxytryptamine, the terminology I'll be using from now on) on the properties of the induced LTP. Presumably, this can tell us something about the function of 5-HT in the normal functioning of the vertical lobe, although this point is very debatable. Why look at 5-HT? Well, for starters, it's one of the big neurotransmitters these days (along with such illustrious nearly-lay-term chemicals as dopamine, norepinephrine, GABA and glutamate.) You hardly need to have a specific reason to study it these days because it's involved in pretty much every process that contemporary neurobiology cares about: consumptive behavior, mood and depression, social cognition, the action of addictive drugs. More than that, though, it's conserved across all bilaterians, the group of bilaterally symmetrical animals including people, the rest of the vertebrates, the insects, and, among many others, the molluscs! If there is any neurotransmitter that is interesting to study comparatively, it's 5-HT, as it's been shown to be involved in learning in animals as distantly related to each other as sea slugs, rats, humans, and (now) cephalopods. If we learn how 5-HT does its job in a wide variety of animals, it will help us understand how neurotransmitters function within nervous systems in general. This is, we will hopefully agree, a Good Thing. The authors begin with the hypothesis that, as has been shown in Aplysia (a beautiful little sea slug who is relatively widely studied in neuroscience,) 5-HT probably has a role in the modulation of LTP rather than inducing it directly, making it a putative neuromodulator. It is not hard to imagine how this might be a good thing to have in a memory system. Let's pretend that our animals has just been injured, or that it has just found a great big source of food. All of these events call for a general upregulation in the formation of memories, since remembering what happened around these events will help the animal repeat or avoid them in the future, depending on whether they were good or bad. If a chemical can increase the amount of LTP (a process thought to be involved in learning,) it would make sense that it might be selectively secreted or expressed during times when the animal's memory system needs to pay attention to what's going on, and not when there is nothing of consequence happening. This is an extremely limited view of the role of neuromodulators in learning, but it illustrates the principal as well as I know how to. In short, neuromodulators, while not responsible for neurotransmission and plasticity themselves, have some effect on it. This sort of effect is one of the things that allows the great flexibility of neural systems, one of their key features. In the first part of their study, the authors stained slices of the octopus vertical lobe for 5-HT, and then described what they say - this is good old fashioned neuroscience. They found that 5-HT shows up in fibers from the medial superior frontal lobe (MSF) that innervate large areas of the vertical lobe. The MSF is thought to be one of the main sources of input of sensory information to the vertical lobe, and this tract of fibers (known as the MSF-VL tract) is thought to be involved in the formation of sensory memories in the octopus, as per J. Z. Young's early lesion experiments in the octopus. The authors note that this wide spread of 5-HT is typical of neuromodulators, supporting the idea that MSF neurons use 5-HT to modulate LTP in the vertical lobe. In the second part of the study, the authors use a technique where they induce LTP in live slices of octopus brain (cool, right?) by repeatedly stimulating the axons running from the MSF to the vertical lobe. They measure the "strength" of neurotransmission as fPSP's, or synaptic field potential, which is roughly an indicator of how much electrical activity is generated by activity in many synapses within a small area of the tissue. I'll only summarize one of their several experiments here, because it is the one that really illustrates the neuromodulatory effect. This figure shows the results of an experiment using induced LTP in octopus brain slices. The experimenters stimulated the brain slices along the MSF-VL tract and recorded the resultant electrical activity in the VL. Let's start with the first graph. The y-axis shows the amount of activity recorded in the vertical lobe after a very small electrical stimulation (this is what each data point is.) The x-axis shows the time from the beginning of the experiment. At about 30 minutes, MSF-VL neurons were stimulated with a "triplet", which consisted of three pulses in quick succession. As we can see in the control preparation (the blue line,) this w pas not enough to induce LTP, which would be evident as an increase in the field potential. In a preparation treated with 5-HT, however, this stimulation was enough to elicit some LTP, which is apparent as a stable elevation of the recorded field potential at times 50 and 60 minutes. After 60 minutes, each preparation was subject to high-frequency stimulation, which caused maximal LTP in both cases. The bar graph next to it (B) shows the results of multiple experiments, showing that before high-frequency stimulation, the treatment with 5-HT caused an increase in the LTP resulting from the triple-pulse, indicating that the presence of 5-HT made MSF-VL synapses prone to undergo LTP. The second line graph (C) shows the results of a set of similar experiments, except that the stimulation was done once per minute. As is apparent, treatment with 5-HT (shown by the red bar) increased the rate of LTP; however, as indicated in the adjacent bar graph (D), it did not increase the maximum amplitude of LTP. It's important to remember that in the active nervous system, it's unlikely that synapses are ever stably at a maximal strength. That increase in the rate of induction of LTP, modest though it may seem in this experiment, could be crucial in affecting the functioning of a memory system in a behaving animal. In the "real world", the stimuli involved in learning are often only present for a short time, and the state of any particular synapse in the nervous system is determined by an incredibly complex set of chemical factors. Neuromodulatory activity (like that argued for in this paper) provides a sensitive mechanism by which the functioning of a neural system could be finely coordinated, allowing the integration of a variety of information into one system that can make a timely decision about whether an action was good enough to repeat or bad enough to avoid in the future. For convenience's sake, I skipped a variety of other interesting experiments that the authors did, and I encourage you to get the paper yourself and read it, if you can. I very much like this type of research, and I like the challenge that blogging about it presents. Anyways, I hope you've enjoyed this as much as I have! Next on my (long and growing) list of cephalopod photographers to feature here is Klaus M. Stiefel, a neurobiologist who currently works in Okinawa. All of the photos in this post were taken by him. He was cool enough to release them under a creative commons license, so feel free to use them, just don't use them for anything commercial and make sure to give him credit (lots and lots of it.) You can click through on all of the photos to access them on Flickr, including larger versions (which I always recommend - they make great desktop wallpapers.) Let's dive right in, shall we? 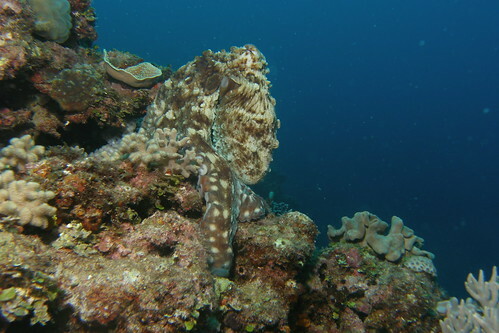 Moving right along, we have these two lovely photos of the flamboyant cuttlefish, Metasepia pfefferi. Klaus calls this posture a "threat display", although I'm pretty sure it is used both as a defensive behavior and during hunting, especially for shrimp and prawns. My favorite thing about pictures of M. pfefferi is that they always look so relaxed, just because of the shape of their pupils. 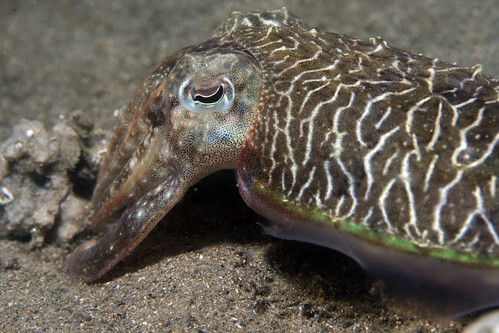 Last in our illustrious lineup of cuttlefish is an unidentified individual who is expressing its papillae beautifully and showing off its ability to use binocular vision by looking at the camera with (count 'em) two eyes. You want squid? We've got squid! Well, a squid. This is a juvenile squid (species unknown, though one of the commenters on Flickr suggests that it's a bigfin reef squid, Sepioteuthis lessoniana) floating among the fronds of a sea lily. Here is an octopus (again, species unknown) expressing a very striking white ring around its eye. 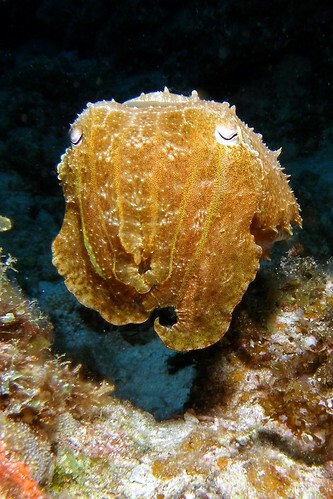 This looks to me like it might be related to the eye-bar body pattern component, which is used during defensive behavior by adult octopuses to obscure the shape of the eye or make it appear larger than it really is. Here's a great shot of some octopus arm suckers, showing various degrees of flexion of the suckers themselves. I wish I knew the species of octopus that these belonged to. In this series of photos, Klaus captured a dramatic color change in an octopus. It looks to me like the octopus tried to camouflage itself, then decided that wasn't going to work and began to hide under the rocks. 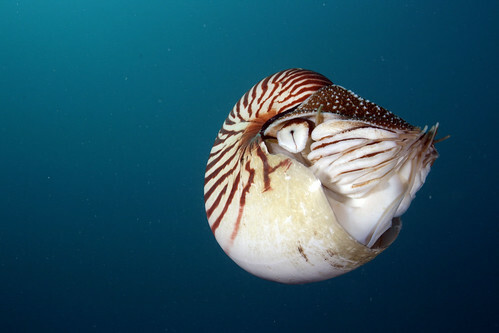 Finally, we'll close with a gorgeous photo of a cephalopod that is too often ignored: the Nautilus. I stumbled upon the Flickr group: Cephalopods , and decided that it was about time to put up some more eye candy on the site. I've gotten in touch with some of the photographers whose cephalopod photos are in the group, and I'll be doing a series of posts with each post featuring the work of a single photographer. First is an octopus (looks like it could be O. cyanea to me, but I'm not the best at species identification) in a neat posture, with a very striking pattern of coloration. 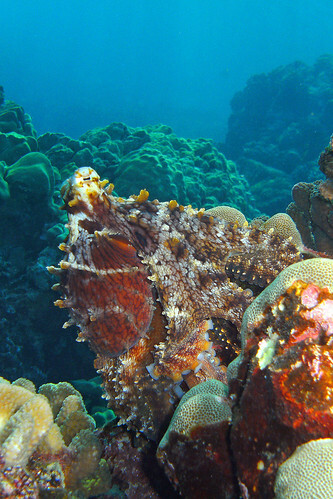 This was taken at Truk Lagoon, which sounds like an incredible place to dive. 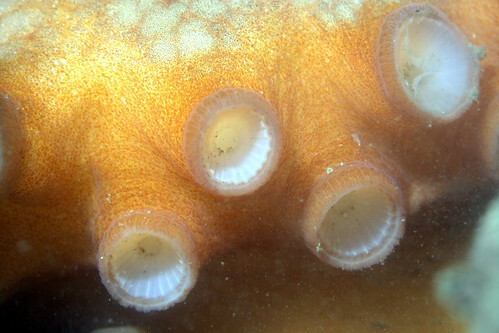 This next one shows the suckers of a giant Pacific octopus. I like that you can see suckers in various states of contraction, showing the great flexibility that having multiple sets of muscles in each sucker affords the octopus. This next one is of O. briareus, the Caribbean reef octopus, showing off its long arms and exhibiting some great body patterning. This posture is probably defensive, judging by how conspicuous its coloration is and the fact that the interbrachial web is spread. This picture shows the eye of a giant Pacific octopus. 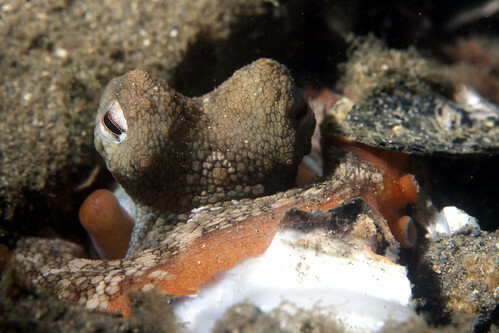 The description of the photo says that the octopus was in its den, and the closed pupil slit indicates that it was likely resting. 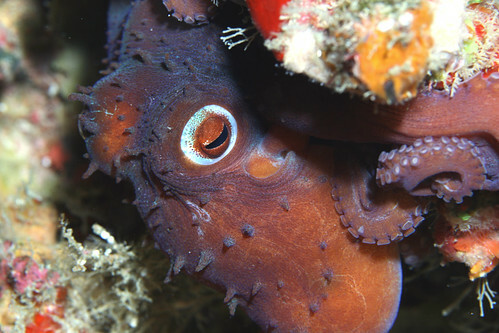 In a neat case of functional homology, octopuses, like many vertebrates, tend to close their eyes when they rest - it's just that, since they have no eyelids, they do this by closing their pupils. If you don't believe me check out Brain and behavioural evidence for rest-activity cycles in Octopus vulgaris by Brown et al. (2006). Thanks for the photos, Lawrence! Everybody else, thanks for reading. I'll be writing on some brand-spanking-new research on the role of serotonin in the octopus learning system next week, so I'll see you then! Pass the clams, please: A strategy for object retrieval in the octopus. The study I'll look at today is Octopuses Use a Human-like Strategy to Control Precise Point-to-Point Arm Movements by Sumbre et al (2006). In it, the authors study a more complicated movement: retrieval of an object using a single arm. This is a problem of interest to neuroscientists and roboticists, because understanding how the octopus generates controlled, precise movement using an appendage with so many possible movements might give us some insight into the optimal solution of this problem. This could help reveal general rules of efficiency in neural programming. It turns out that most of the distance covered in this movement sequence comes from the arm's rotation about the medial joint (the yellow one), much as most of the effective range of human retrieval movements come from flexion of the elbow. After some more detailed analysis of the kinetics of this movement (which I'll skip here - but please check out the paper if you're interested) the authors go on to probe the pattern of muscle activity that is responsible for this movement as they did in their earlier studies (for a brief explanation of their methods, see my earlier post; for a longer one, see the paper reference therein.) They found differences in patterns of muscle activity depending upon where in the arm recordings were being made. When they looked proximally to the medial joint (eg. in arm segment L1 in the above diagram,) they found that a wave of muscle activity propagated away from the body, as it does in reaching movements. When they recorded from a portion of the arm distal to the medial joint (eg. in arm segment L2,) they found that muscle activity was propagating in the opposite direction - from the tip of the arm towards the base. Using these results, the authors offer an elegant explanation of the neural control of this behavior. They suggest that the initiation of a retrieval movement involves the initiation of two waves of muscle activity, one starting from the tip of the arm and one from the base. Where these waves meet, the medial joint is formed. 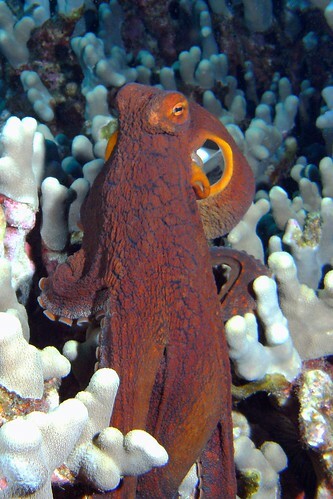 In this way, the octopus nervous system simplifies the problem of finding an efficient way to retrieve an object, a problem which would be hard to solve on the basis of proprioception or neural control contingent on a direct representation of sensory space due to the flexibility of the octopus's body. In case you were wondering (I sure was), an experiment that was reported in the supplementary material (though it seems pretty important to me) revealed that retrieval could not be elicited in denervated arms in the way that arm extension can. Therefore, it appears that some input from the central nervous system is required to initiate this more complicated movement, although it is still possible (and seems likely) that, once initiated, the movement is driven primarily by peripheral mechanisms local to the arm performing the movement. The authors found that ablation of the anterior basal lobe left octopuses unable to initiate object retrieval, confirming its suspected function as a motor center in the octopus. to the multijoint articulated limbs of vertebrates. I have no particular problem with this hypothesis. I'd be interested to see if these types of movements are present in other species of cephalopods, both decapods and other octopod varieties. I think that the case for convergent evolution in this instance will always be a hard sell, because (unlike, for example, the eye) the anatomy of the body parts executing the movement in question are so different. 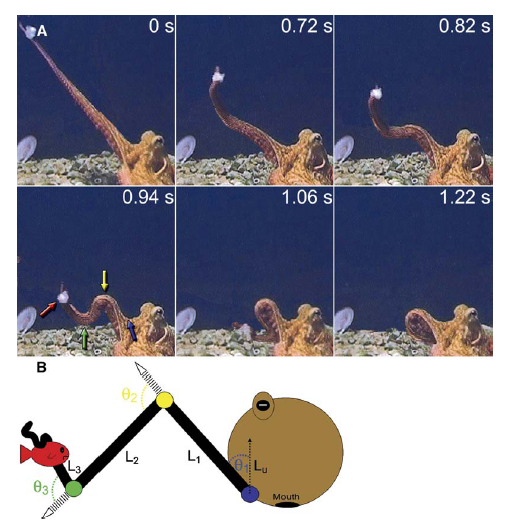 In addition, the movements studied in this paper were elicited in very specific conditions using octopuses that were trained to extend their arms and wait for food to be pressed to them, leaving it unclear what other types of movements they might make in retrieving an object as well as the relative importance of the aforementioned quasi-articulated arm movements in the ethogram of the octopus. Those criticisms aside, I'm willing to accept the idea that articulated movement really does represent a good solution to the problem of controlling movement, because it shows up across animalia so often and in so many forms. Why wouldn't we expect the octopus to get in on the action? to describe octopus behavior, at the very least because the implications of play-like behavior in the octopus are not very well studied yet. It's much harder to determine the motivational significance of an activity in an octopus than it is in, say, a rat. This is because we know the brain and behavior of the rat much more thoroughly than we know those of octopuses, and since they are structurally similar to ours we can relatively easily design valid measures of motivation in rats. 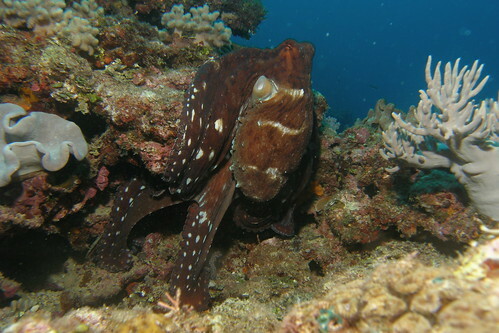 In contrast to the vast (though still incomplete) neurological and behavioral description of pleasurable and aversive states in the rat that we have generated, we have only a very crude measure of the possible hedonic characteristics of an activity in the octopus; that is, we can assume that the octopus will do "pleasurable" things and will avoid aversive things, but we have little more to go on when we are talking about the motivation of an octopus. Because of this limitation, I think that it may be too early to say for sure what processes play-like behaviors in the octopus actually represent, and so the touting of play as evidence of the impressive mental powers of the octopus also seems premature. Whoa, now! Before I go making assertions like this, I should look at the research, right? Good call. Let's see what the vast scientific library that is the internet can teach us about the play-like behavior of octopuses. By this point, I tentatively buy the characterization of these behaviors as "play" - they don't appear to serve any purpose for the octopus, who is clearly not simply confusing the objects with food. They are exhibited after the octopus has presumably had ample time to learn that they do not represent a threat. The behaviors do not appear to clearly belong to any other class of behavior (except perhaps tactile exploratory behavior.) As I said before, however, using the existence of these behaviors to argue for the intelligence of the octopus seems premature to me. 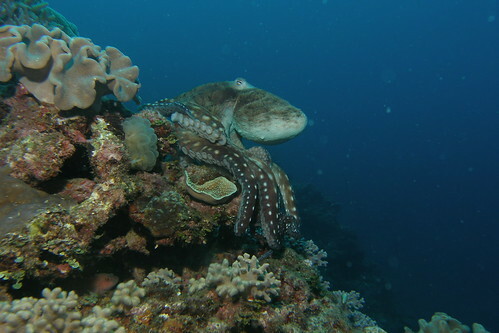 For one, the significance of these behaviors in the wild is not well understood - they must confer some survival utility, but they do not appear to be disproportionately expressed in young, rapidly developing octopuses as they are in mammalian young, and so are unlikely to contribute to neurodevelopment in the same way that play in mammals (especially social mammals) is thought to. We know that play in social mammals (like humans, some apes, and rats) serves a variety of functions in development - to establish dominance hierarchies, to develop skills for living within social organizations, to learn hunting and food-gathering behaviors, to help develop motor coordination, etc. We have comparatively little sense of the importance of play in the life of an octopus, and so it is hard to know what play-like behavior means in the context of octopus cognition. Because we know that play is very important to the cognitive function of mammals I mentioned previously (more properly, we know that disrupting play behavior causes deficits in behaviors that depend on play to develop,) we can claim that play is part of a group of behaviors that make manifest the intelligence of these animals. Without knowing what play-like behavior does for an octopus, it's hard to say whether it implies an analogous intelligence in these animals. It might be explained in many cases as a simple extension of exploratory behavior. As a foraging predator, it makes sense that O. vulgaris would be served well by repeated, thorough explorations of the same object, which mobile and semi-mobile prey would presumably periodically be found on. This behavior might be explained as part of a foraging strategy that is somewhat impervious to associative learning, and so violate the criteria that we use to classify a behavior as play all together. My discussion thus far has accepted the hypothesis that behavior classifiable as play occurs regularly in the octopus, and thus needs to be explained in terms of its adaptive utility to the animal. 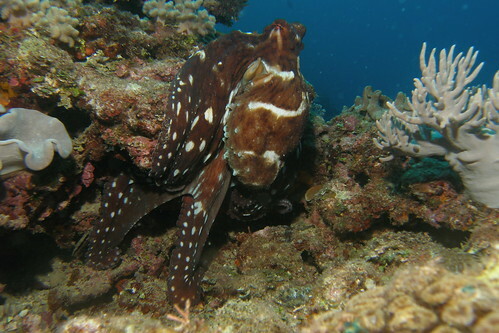 Based on the previously summarized paper, however, clear play-like behavior in the octopus appears to be pretty rare. On the 5th day of the experiment, when play-like behavior peaked, 444 interactions with the stimuli were observed. Out of these, 13% qualified as level 2 (they involved manipulation beyond very basic exploration of the object with the arms,) 0.9% were scored as play-like, and a single observation (0.02% of the total observations) was scored as being definitively "play". I think this was a well-designed study, but the results don't convince me that play (as defined by the authors) is terribly important in the lives of octopuses, and might just as well represent a rare, specific type of interaction that they have with unusual stimuli in a laboratory environment. I realize that I have been sort of hard on this study. I don't want to imply that octopuses are not remarkable animals that are capable of many things one wouldn't expect from a mollusc. I do think, however, that it pays to be very skeptical about the use of the terms "play" and "intelligence". Both of these are concepts that we understand primarily by analogy to our experience of them as humans. We know that social play in vertebrates is indeed play (even the scientists among us) because we know what a play fight feels like, and understand intuitively how it differs from a real fight. We can extend this to behaviors that we see in animals (with more or less accuracy, depending on the situation.) We know what intelligence means (or we think we do) because we have expectations of how people should function, and we can draw analogies to other vertebrates who have the same sort of behavioral flexibility and environmental demands that we do. One might dismiss this as unscientific, but we have pretty good evidence that the neural structures that are responsible for a variety of emotions and types of behaviors are conserved in some form across species (in mammals at least.) Thus, we can be somewhat comfortable in our understanding of the role of play in a rat's cognitive life because, at a pretty complex level of structure and function, they have essentially the same machinery in their head that we do. It's a bit less convincing to use the same anthropomorphic logic to justify associating what looks like play behavior in an octopus with the "intelligence" that we suspect goes along with play behavior in vertebrates. This is because the existence of analogous neural substrates and their accompanying cognitive functions (emotions, hedonic value, etc.) is not clear. It strikes me as somewhat mistaken that we would use psychological constructs that were created to describe human behavior such as "play" and "problem-solving" to describe cephalopod behavior, though we do it even when they appear to be a poor fit to the behavior in question. 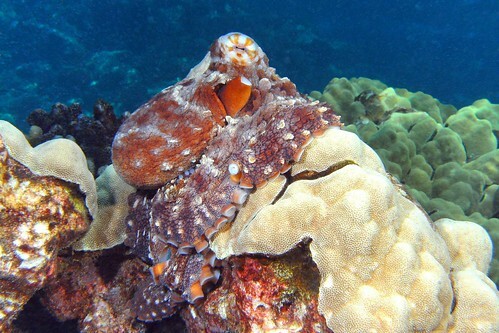 As Jennifer Mather points out in her quote in the Boston Globe article: “We’re smart and the octopus is smart, but octopus intelligence just can’t be related to our intelligence.” This I have to agree with. Just because we can call a behavior something that sounds familiar (in this case, "play") doesn't mean that we've explained it, even though it might appear this way. I think that octopuses are fascinating and astounding creatures that exhibit very interesting behaviors; I'm just not quite convinced that they play. I was planning on writing an article about cephalopod statocysts (and I still am; I've just had trouble deciding which pieces of research I want to cover and which I want to leave out) to continue on the theme of cephalopod sensory systems. I've stumbled upon a line research that I just had to blog about, though, so I'm putting off the statocyst post even further. 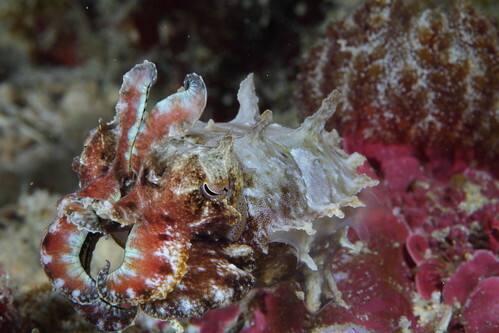 The research in question is a series of studies by The Octopus Group at the Hebrew University of Jerusalem on the biomechanics and neural control of reaching movements of octopuses. I read this research some months ago (before I was blogging,) and I was reminded of it while watching Twister (the resident E. dofleini at the Niagara Falls Aquarium) groping about in his enclosure. I noticed that, as he moved his arms about, the movements almost always started with a bend near the base of the arm, which traveled out to the tip, becoming sharper and moving faster as it proceeded. It looked for all the world like the way a wave travels through water (or, more geek-ily, the way one imagines spontaneous activity propagating in a spatially extended nervous system.) The series of studies I will talk about here shows that this is generally the case, and characterizes the way that this happens with some detail, although we still do not know this system in nearly as fine detail as we know the vertebrate neuro-muscular system. I'm getting ahead of myself, though. 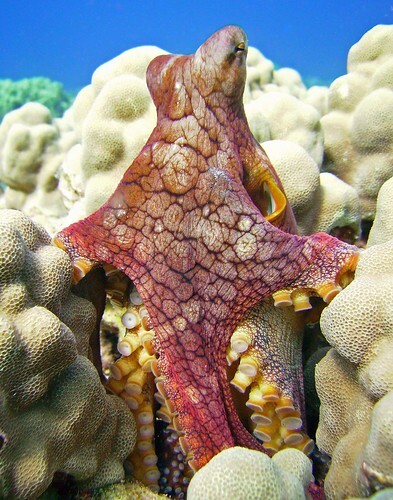 Why do we care about the details of how octopuses move their arms? First, it's just plain cool - who, upon looking at an octopus moving, hasn't wondered how it can possibly keep track of all those arms? Second, the octopus arm provides a unique model nervous system for a few reasons. 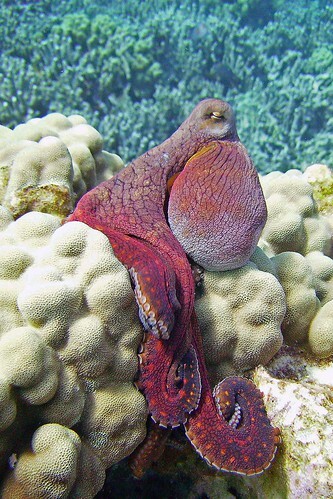 It is a muscular hydrostat - that it, having no bones, it is a system of muscles that run perpendicularly to each other that maintain a roughly constant total volume; this property of an octopus arm allows it to function like a very flexible vertebrate limb because the muscles can pull against each other to form temporary, semi-rigid structures that allow the arms to bear weight. As such, it is a novel motor system (in terms of research, that is,) with most of the well-characterized motor systems we know of (ie. human, primate, reptile, etc.) are composed of skeletal muscles, which pull against bones. Besides this, the task of coordinating the movement of eight almost infinitely flexible arms is a herculean task in terms of neural processing, and it would be very informative (as well as a triumph of systems neuroscience) to understand how this is done. It has been thought, since the early days of octopus neuroanatomy, that much of the movement of the octopus's arms (and probably those of other cephalopods) is encoded in the nervous system of the arms rather than in the central nervous system (Graziadei, 1971). This is evidenced by the fact that there is no straightforward representation of the arms in the brain of the octopus, as there is in humans and most other vertebrates, as far as we know, and so it is unlikely that fine motor control comes from the central nervous system. Supporting the importance of the distributed nervous system of the arms is its incredible scale: the nervous system of the arms is much larger than the central nervous system of octopus, containing around 2/3 of all of the neurons in the animal. The octopus arm, then, is a unique example of a highly complex, distributed motor system that stands in contrast to the centrally controlled motor systems we are most familiar with. As with almost every topic in comparative neuroscience (I'm a big sucker for it), I think that the octopus motor system is important because by understanding it, we will understand more about vertebrate nervous systems; that is, we will (pretending for a moment that we could actually solve both systems) understand which features of them are critically related to the specifics of vertebrate and invertebrate neural functioning, physiology, development, and ecology. We would come closer to understanding why each system evolved the way it evolved. Finally, we would exercise our tools of modeling neural computation in a way that would allow us to figure out how generalizable they are. My final verdict: this is a good thing to study. So now you're bored. You want to hear about some research! Well, I won't disappoint; at least, I hope I won't. We'll start with Gutfreund et al. (1998), one of the early papers out of this research group, which kicked off this line of research by examining the neuromuscular dynamics of octopus reaching movements. I should note that (presumably for simplicity,) this group generally only studies reaching movements in a single arm - it is not know exactly how their findings might relate to more complicated movements, including those involving multiple arms. As a disclaimer I am going to leave out description of a large portion of their study, which I encourage you to read in full, for my own convenience, and only present the results that I think are most relevant to the topic at hand. 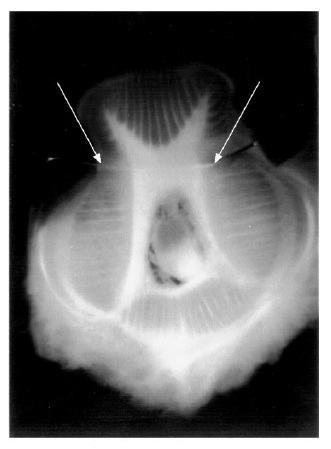 The white arrows indicate the position of the electrode, which is the white line running through the muscle. The striated outer portions of the arm are the muscle, and the round shape in the middle is the nerve cord of the arm. The left panel shows two electromyograms from a single trial, the top one from the electrode nearer to the arm tip, and the bottom one nearer to the base of the arm. The arrows indicate when the bend in the arm reached each electrode. As is apparent, neuromuscular activity at the proximal site started earlier than that at the distal site, coinciding approximately with the timing of the movement of the bend in the octopuses arm. The graph shows the correlation between the lag in the electromyogram record between the two sites and the time it took for the bend in the arm to move between the two sites. It's clear that the propagation of the wave of electrical activity down the arm is highly correlated with the motion of the arm. The authors continue on to characterize some of the properties of these arm movements in more detail and propose a mathematical model for the movement of the octopus arm, but I'll leave those results out, here. I recommend this article for it's methodological clarity - too seldom do authors take such pains to make their method so clear and so thoroughly address their research question. Importantly (for reasons I'll explain in a second,) it appears that the arm movements were initiated, but not sustained by the stimulation. We can tell the difference because the "reaching" movement continued through to completion even when it began slightly after the experimenters stopped stimulating the arm. This shows that the brief stimulation started a motor process that was maintained by the intrinsic neuromuscular system of the arm. The authors also found that similar movements could be elicited in amputated arms by "tactile stimulation of the skin or suckers." After a brief analysis of the kinetics of the evoked movements, the authors conclude that they, like those of intact animals, are caused by a propagation of muscle activity down the arm. The peripheral nervous system of the octopus appears to play a much greater role in the programming of movement that does the peripheral nervous system of vertebrates (which can only independently control simple reflexes and some other involuntary movements like peristalsis), even to the extent that it can execute complex movements (like reaching as if to grasp) all by itself. That propagating wave of muscle activity isn't coordinated by the central nervous system, like coordinated movements are in humans; rather, it's coordinated by the nervous system intrinsic to each arm. This is convenient for the octopus because it means that it generally does not need to keep track of its arms (that is, it's central nervous system doesn't have to spend a lot of resources monitoring and controlling them) because they largely take care of themselves. It's a good solution to the problem of having a large number of incredibly flexible appendages. There's one more article I wanted to cover here, but I don't have time at the moment, and I want to get this up tonight. It's by the same group, and it applies what the previous studies showed to explain the way that octopuses retract their arms after they have grasped their target. Hopefully I'll have a shorter post on that before the end of the weekend. Graziadei, P.P.C. (1971). The nervous system of the arms. pp. 44-61 in Young, J.Z. The Anatomy of the Nervous System of Octopus vulgaris. Oxford : Clarendon Press. A blog documenting my intellectual love affair with the biology and psychology of our many-armed friends. I am a student of Psychology and Pharmacology at the University of Buffalo. I'm planning to pursue an M.D. and a Ph.D in behavioral neuroscience. Brand new DAP gives Mattick a run for his money. T-shirt Tuesday Wednesday: “One of Those Days” from Shirt.Woot! Mr. T pities the fools who haven’t updated their RSS feeds! All posts are licensed under a Creative Commons Attribution-NonCommercial-ShareAlike 3.0 Unported License.